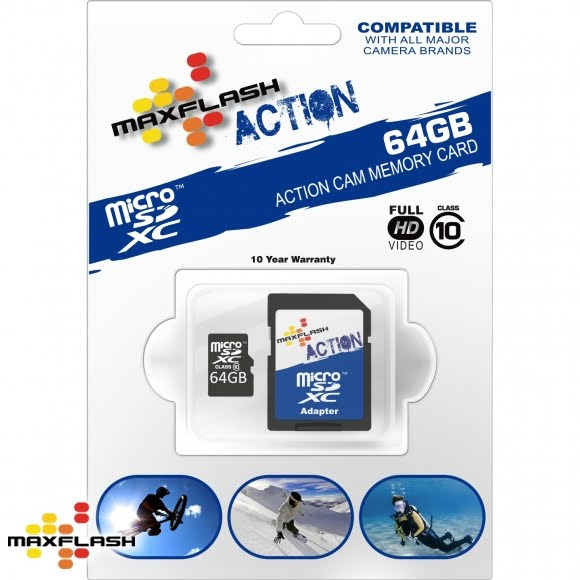 It's always a good idea to keep spare memory around and Maxflash delivers their 64 GB Maxflash Action Micro SDHC class 10 card for seamless data recording and convenience. Perfect for GoPro sports cameras, GPS, Fish Finders, Digital Cameras, Netbooks, PDAs, Smartphones, Mobile phones, Computers and much more. It&apos;s always a good idea to keep spare memory around and Maxflash delivers their 64 GB Maxflash Action Micro SDHC class 10 card for seamless data recording and convenience. Perfect for GoPro sports cameras, GPS, Fish Finders, Digital Cameras, Netbooks, PDAs, Smartphones, Mobile phones, Computers and much more.